Faith in Action is the largest grassroots faith-based community-organizing network in the United States. For over 40 years Faith in Action has brought people of faith together to advance racial and economic justice. Faith in Action organizations have successfully changed public policies at the local, state and federal level that have helped to reduce gun violence, improve the quality of education for children, make housing more affordable and protect families from foreclosure and securing jobs. Through an innovative campaign infrastructure that ties together grassroots people-led organizing in more than 200 cities and towns and 21 states with large-scale efforts to change federal policy, Faith in Action is currently leading campaigns to help with citizenship for 11 million aspiring Americans, end mass-incarceration and make sure that no one is excluded from the benefits of health reform. 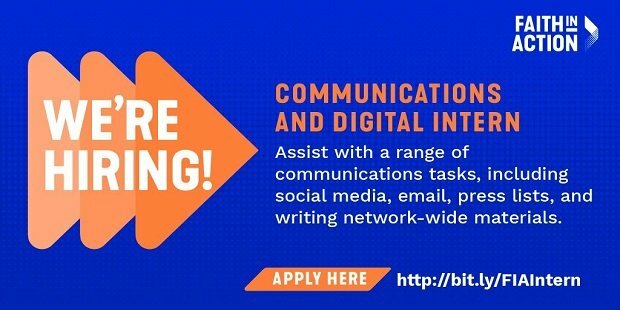 Faith in Action is seeking a Communications and Digital Intern to assist in writing social media posts, drafting emails, researching and compiling press lists, and preparing network-wide communications materials. An ideal intern will be open to any communications task that arises. The Communications and Digital Intern reports to the Managing Director for Communications and works directly with Faith in Action’s communications department to drive messaging and develop strategies for Faith in Action’s digital campaigns, federations and allies.